Annok Sarri and Karin Bergström are lions in a cage at kindergarten. The others want them to come out. Annok throws a doll breaking a mirror in a thousand pieces. Karin wants to comfort her but Annok needs to go outside and calm down. With an adult. Karin doesn’t have much to do without Annok. And she isn’t coming back but moving far away: to Karigasniemi, Utsjoki, Lapland. This book is about a small and shy observer who becomes warm from being seen. About caregivers at kindergarten who do not understand and parents who don’t fit in. About children’s powerlessness when faces with great changes. And that nothing can ever completely disappear. Especially not friendship. 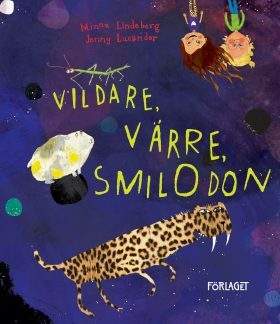 Minna Lindeberg’s and Jenny Lucander’s first picture book together is örsta gemensamma bilderbok är earnest, wise and wild at heart.